Giving Top 2 HGOTY year is not easy, doing multiple films & bringing your 2 film on top of all films released is big achievement for any Star. Down the years have a look at some of the stars who manage to do this. - Only Amitabh bachchan & Salman Khan are been able to give Top 3 films of the year in terms of GROSSINGs. - Only star to give All Time Blockbuster & Blockbuster in a single year is Shah Rukh Khan. - Only star to give this feat back to back is Salman Khan - 2011 & 2012. - Only star to achieve this feat in a Decade 3 times is Salman Khan - 2011,2012 & 2015. This year it is high chance that Salman will hit his 5th time feat with Tubelight & TZH scoring at no.1 & no.2 position. which was a dubbed movie.....and not a bollywood movie...........so they dont count. yes it will .......... your prediction meter is wrong. 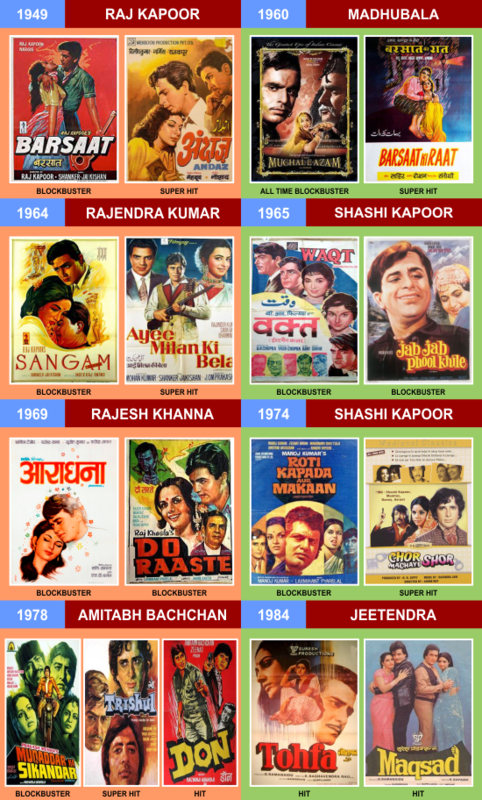 Which would be the Highest Grosser of the Year for 1970,1976,1980,1982,1984,1987 and 1990 according to New Updated BOI?